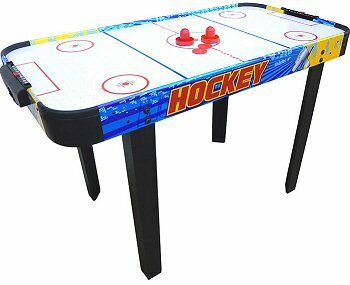 Our Mightymast 4ft Whirlwind Hockey Table is a working air hockey game for all the family. The powerful internal electric fan creates an air cushion on which the puck can move at high speed, helped by the high-gloss playing surface. It also has rounded corners and is stable, yet light enough that it can be moved around easily. Comes complete with all accessories. This table is not too large and heavy, yet provides a good game for all the family, but is especially odeal for children as it is of a more manageable size than the larger full-size tables. The puck glides well over the air cushion provided by a more-than-adequate fan. All-in-all, a very good buy if you are looking to provide an exciting family game at Christmas and beyond.